Ariana Grande may have taken home the award for Best Pop Vocal Album, but her fellow nominee P!nk is still a winner in the eyes of her kids, and to prove it, they presented her with a homemade Grammy. P!nk has been nominated for 20 Grammy’s in her almost two-decade career – and she’s taken home three awards from the annual ceremony – but you can bet your bottom million dollars this one is the most precious. To honour their mum’s achievement, her kids made her a special DIY Grammy award, and I think my heart is about to explode. P!nk, whose real name is Alecia Beth Moore, is already a three-time Grammy-winner, having picked up the gong in in 2004, 2011 and 2012. But her seven-year-old daughter, Willow and her son, Jameson, who’s two, presented her with an award of her own after Ariana Grande pipped her to taking home the award for Best Pop Vocal Album. P!nk was in the running for her album Beautiful Trauma, but Ariana’s Sweetener – featuring viral tracks like Thank U, Next won out. 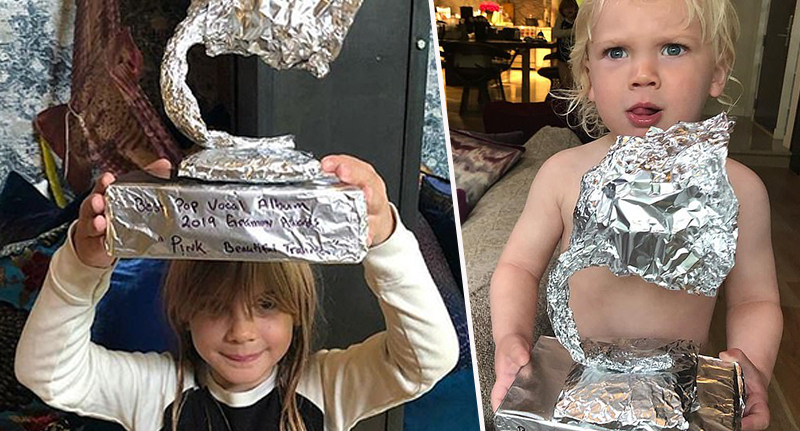 The talented mum-of-two shared photographic evidence, enough to make a mother swoon, on an Instagram slideshow showing her kids proudly showcasing the makeshift Grammy. It looks like it was constructed of tinfoil, and possibly a cardboard box, and they’d written on the front. P!nk is having a bloody great month as it is, having unveiled her star on Hollywood’s Walk of Fame, the music business bosses across the pond here in Britain have announced they’ll be honouring the songwriter too. The Missundaztood singer will be the first international recipient of the prestigious Outstanding Contribution To Music award at the Brit Awards, in recognition of her chart-topping ­success over nearly two decades. It means the songwriter will also become the first ever female solo artist to scoop the gong. She will be flying in from LA, where she lives with her husband and two kids, to accept the honour and perform at the Brits, which’ll take place on February 20 at the O2 Arena in London. Elsewhere on the night of the Grammy’s, Record of the Year and Song of the Year went to This Is America by Childish Gambino, Kacey Musgraves took home a Grammy for Album of the Year with his entry, Golden Hour, and Dua Lipa picked up Best New Artist.